With $50,000 up for grabs in a cupcake competition, Missy Gladstone has to be on her A-game, if she plans on expanding her business, but that doesn't prevent her from deciding to use the competition as an excuse to unwind in Las Vegas while she's there. 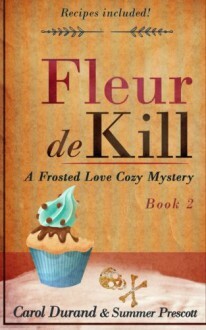 When she arrives, Missy quickly learns that the reason she's been invited to compete has less to do with her culinary skills and more to do with her old childhood frenemy, who is now a big time celebrity baker with TV shows, a line of bakeware, and a chain of cupcake shops across the country. Knowing that her old rival always had a few tricks up her sleeve, it's no surprise when Missy discovers that the invitation came with ulterior motives. A sticky proposal puts them at odds once again, only this time Missy's business will be on the line. Before Missy knows what's happening, her frenemy is found dead in her hotel room and all eyes are on her. Alone, far from home, Missy will have to reach out to the only ally she has, Detective Becket, and hope that he could help her out of this confectionery mess before its too late.